Simon & Schuster, 9781439195482, 272pp. Joseph Helfgot, the son of Holocaust survivors, worked his way from a Lower East Side tenement to create a successful Hollywood research company. But his heart was failing. After months of waiting for a heart transplant, he died during the operation. Hours after his death, his wife Susan was asked a shocking question: would she donate her husband’s face to a total stranger? The stranger was James Maki, the adopted son of parents who spent part of World War II in an internment camp for Japanese Americans. Rebelling against his stern father, a professor, by enlisting to serve in Vietnam, he returned home a broken man, addicted to drugs. One night he fell facedown onto the electrified third rail of a Boston subway track. A young Czech surgeon who was determined to make a better life on the other side of the Iron Curtain was on call when the ambulance brought Maki to the hospital. Although Dr. Bohdan Pomahac gave him little chance of survival, Maki battled back. He was sober and grateful for a second chance, but he became a recluse, a man without a face. 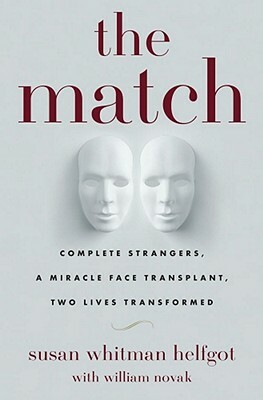 His only hope was a controversial face transplant, and Dr. Pomahac made it happen. In The Match, Susan Whitman Helfgot captures decades of drama and history, taking us from Warsaw to Japan, from New York to Hollywood. Through wars and immigration, poverty and persecution, from a medieval cadaver dissection to a stunning seventeen-hour face transplant, she weaves together the story of people forever intertwined—a triumphant legacy of hope. "This is truly an outstanding book! I could not stop reading." "Magnificent. . . . it’s actually about people. I’ve never read a book so fast before and with such pleasure."